The Toronto Design Offsite Festival is coming to #YongeStClair for the first time THIS month from January 15-21st, 2018. There will be a week’s worth of art and festival programming anchored by three incredible installations designed by leading architecture and design firms Gensler, IBI Group and Superkül. 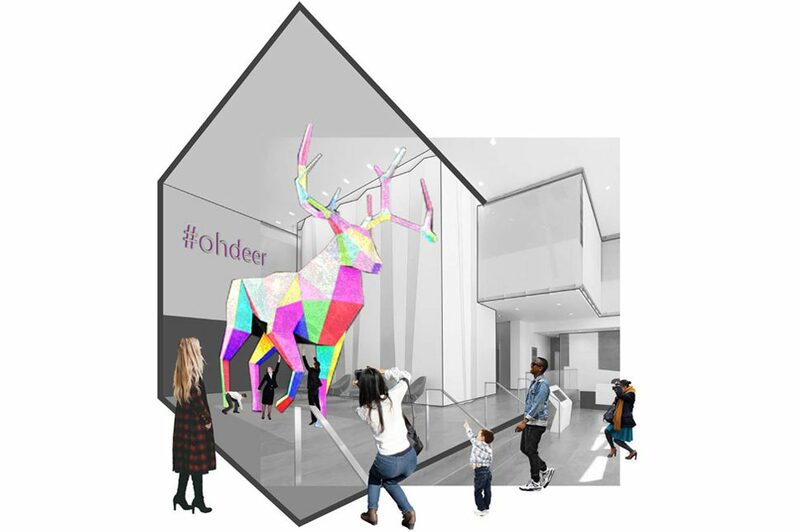 We had the chance to catch up with the team at Gensler (Pelin Yeter, Matteo Maneiro and Gillian Walczak) who are responsible for the much anticipated installation titled #ohdeer coming to 2 St. Clair W. Read below to learn about Gensler’s guiding principles, and #ohdeer‘s relevance to the surrounding community. Can you give us some background on Gensler and its approach to design? What are your guiding principles? Yeter: Established in 1965 by our visionary founder, Art Gensler, Gensler is now the world’s largest architecture, design, and planning firm with 44 locations and over 5,100 professionals in the Americas, the UK, the Middle East, Australia, and Asia. The firm has 29 practice areas in virtually every industry and delivers projects as large as a city and as small as a task light. We believe it all begins and ends with our client relationships. This is the first of Gensler’s ten guiding principles. With more than 3,500+ active clients, clients come first in everything we do and finding innovative design solutions for our their goals and challenges is what we do best. Our clients are remarkably diverse: large and small, private and public, profit and non-profit. We help them grow, sustain and transform: whatever it takes to embrace their future. Despite 50 years of growth and change, we’re still passionate about design’s power to make a real difference for the organizations and people we serve. For us, design is the means. The starting points are goals, strategies and expectations, but it transcends them to create a new and better reality. Design is transformative and we believe in the power of leveraging it to create a better world. This is the first year TO DO festival is at Yonge + St. Clair. What was the thinking behind “#ohdeer” and its relevance to community and its history? Maneiro: #ohdeer is an installation where time is the subject, it is intended to play out over the course of the week. Upon arrival, subjects are presented with a tongue-in-cheek reference to the neighborhoods story and name, Deer Park. The oversized deer is collaged with an emblem of spectacle, anticipation and celebration, the piñata. Our interest here is in the power of the inanimate object, paired with symbols within a certain context. The familiar facilitates engagement and the playful stimulate exploration. This installation attempts to open a window into the neighborhood’s future through its past. The community is not only encouraged to participate, it is central to the activation of oh deer’s spectacle marking a time of rejuvenation at Yonge and St. Clair. #ohdeer is a playful reminder of the part community plays in the story of one’s neighborhood and city. Collectives are the true catalysts for prosperity. Structurally, what will the deer be made of? Walczak: The deer will start off with a wooden frame and base. A secondary structure of interlaced cardboard pieces will be secured on top of the frame. Before closing up the piñata, treats and surprises will fill the spaces between the cardboard pieces. One layer of kraft paper will then be wrapped around this ‘skeletal’ structure, forming the deer head, body and legs. The final touch will be the colourful pieces of fringed paper that will form it into a true piñata. To find out what else is going on during the festival, be sure to visit our main page HERE.